Lesley Penwill can be relentless in bending a subject’s will to her vision. “The piece makes promises to you and you have to hold it to them,” interjected Otterville painter Lianne Todd. The transformative process is one Penwill’s husband Mike is familiar with, if not subject to. Original art resulting from unique creative vision through diverse media lies at the heart of the 11th Annual Oxford Studio Tour, Saturday May 5 and Sunday, May 6 from 10 a.m. to 5 p.m., both days. Supported by event sponsor Bossy Nagy Group and a list of featured advertisers, a total of 37 artists in 19 locations are participating, showcasing unique oil, acrylic, watercolour and encaustic paintings, pen and ink and graphite drawings, mixed, digital media and photography, jewellery, weaving and fibre arts, gourds and pottery. A full list of artists and studios by location, detailed tour Google maps and related information down to parking tips may be found at oxfordstudiotour.ca. Glossy full-colour brochures also featuring maps are available from the Station Arts Centre, Tourism Oxford, Ingersoll Creative Arts Centre, libraries throughout Oxford County and at southwestern Ontario tourism offices. During the two-day tour, each of 19 sites will feature distinctive red signs. Those seeking more information are invited to call the Station Arts Centre at 519-842-6151, email office@stationarts.ca or access the ‘contact us’ option on the tour webpage. Oxford’s geographical diversity and the unique nature of its communities are definitely part of the experience says Beard, but due to its size, some tour participants may choose to focus on different areas of the county in alternate years. She also suggests advance research, allowing concentration on specific areas of interest. One does not have to be an artist to appreciate the latter, but it certainly has been the experience of painter Paul Walker, who has been working with acrylics for 15 years. A two-year resident of Tillsonburg via Restoule (exhibiting on the Country Roads studio tour) and a working career as an engineer in Hamilton, he is one of four new exhibitors to embrace ‘an exciting opportunity’ within a community of Oxford artists whose number and diversity surprised and impressed him. Otterville’s Todd both ‘bends’ and is bent by artistic inspiration, creating fractal art, capturing and printing snapshots on brushed aluminum of a striking moment during her exploration of the geometrical patterns in nature within a digitally-generated realm; and conversely, more traditional watercolour interpretations, not so much a precise rendering, but conveyance of their artistic essence. Paulette Robertson exhibits her own version of artistic diversity, a whimsical combination of primitive rug hooking reflecting her Maritime background, and hand-built pottery evolving from years of teaching children’s pottery. Like Robertson, Woodstock’s Keri Axon has experienced a journey, hers from sewing and weaving to decorative functional and non-functional wheel and hand-built pottery as retirement allows her to more fully explore her creative side. Otterville-area artist Sue Goossens’s traditional, yet innovative watercolour style will also be on display, including a series on Scotland and an exploration of Vancouver Island. “And playing around a bit with new colours,” said Goossens, who as one of the tour’s founders, remains pleased not only with its longevity, but continued evolution and growth while remaining true to its core principles. “It’s original art for everyone,” she concluded. 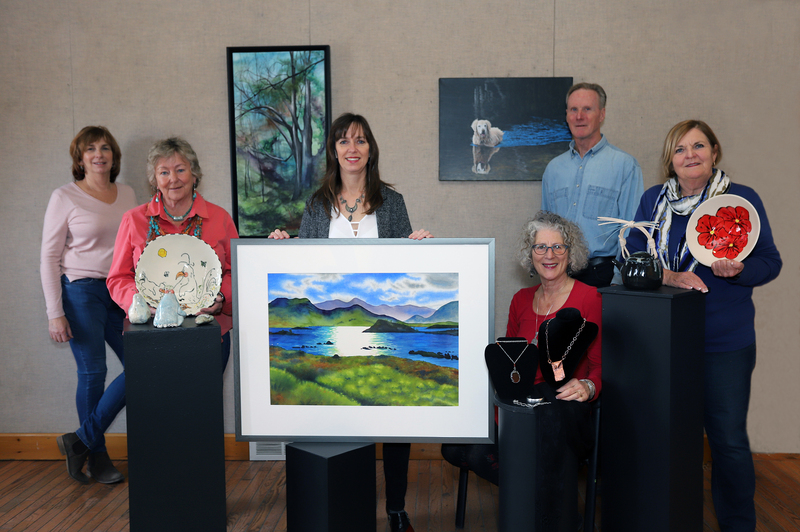 The 11th Annual Oxford Studio Tour is scheduled for Saturday May 5 and Sunday, May 6 from 10 a.m. to 5 p.m. both days, featuring 37 artists at 19 locations throughout the country, including (left to right) Sue Goossens, Paulette Robertson, Lianne Todd, Paul Walker, Lesley Penwill and Keri Axon. A full list of artists and studios by location, detailed tour Google maps and related information down to parking tips may be found at oxfordstudiotour.ca. Those seeking more information are invited to call the Station Arts Centre at 519-842-6151, email office@stationarts.ca or access the ‘contact us’ option on the tour webpage. Please feel free to share this press release and help us spread the word about our studio tour. The artists appreciate your help!